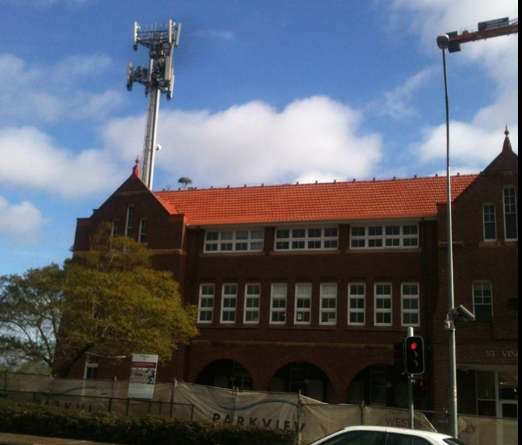 This is the building where I am expected to work on a regular basis sometime soon (Westmead Hospital precinct, Sydney). I managed to negotiate my way out of being in the office daily due to EHS with a letter from my Doctor using the EUROPAEM Guidelines) – but my workplace just moved to a new building (the one in the photo) and after an external assessor they think they can shield my office sufficiently for an EHS person. I think the shielded office might be ok but other areas will not be – and I will be expected to join meetings etc on a regular basis throughout the day. Any thoughts Warriors? I’ve been doing lots of Dr. Jack Kruse stuff but still felt slammed after being in the building for 90 minutes yesterday (RF = 1.9-2.5V/m using a TES593 meter; Dirty Electricity = 1000 units at 3 powerpoints and 1950 units at 1 powerpoint using a DE meter; magnetic fields fine – under 1 milligauss – all measurements taken before people were in the building and using the Wi-Fi network/ equipment).